The coalition’s aboriginal policy release a day before the election which is keeping with their approach to avoid scrutiny. Here’s my assessment. Their policy doesn’t have a theme which means they have no positive outcome for aboriginal people and want to hide the fact that it is an assimilation policy. They have an “indigenous advisory council” made up of aboriginal and non-aboriginal people known by Tony Abbott. Abbott adopts this approach to have aboriginal people that have already converted to the assimilation process go out and convert more aboriginal people to the assimilation process. Governments must negotiate with representatives of each and every aboriginal nation group. The portfolio of aboriginal affairs will now sit in the prime minister’s department meaning that no do-gooders in the public sector can do anything positive for aboriginal people without the prime minister being able to step in and put a stop to it. They support recognition of aboriginal people in the preamble to the Australian constitution, which isn’t legally binding and therefore provides no power to aboriginal people. They will implement Noel Pearson’s ’empowered communities’ policy approach to aboriginal communities which is based upon the ‘direct instruction’ teaching model for his people. This approach involves teachers following a script and students mimicking them and places all the power in the teacher’s hands. It attempts to replace bad habits with good habits but it creates a ‘cult’ environment that gives teachers and governments control over aboriginal people. What need healthy aboriginal people who can take care of themselves and are no longer reliant on welfare. But that’s what Abbott wants, an environment where every aboriginal community in Australia is obedient and compliant to his every command. 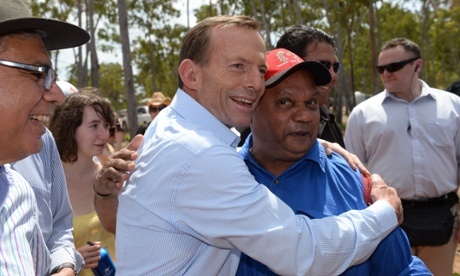 Abbott will offer the empowered communities approach to eight aboriginal communities. What Abbott will do here is to pick the eight most susceptible and vulnerable aboriginal communities that they can stand over and make comply with their fascist approach. Then once they have conquered them they will sell it to the rest of white Australia as a solution from which they can impose on all other aboriginal communities. Abbott paying Twiggy Forrest’s Generation One project is to enslave aboriginal people to work for mining companies for minimum wage when aboriginal communities should be reaping the royalties entitled to them as the traditional owners of their lands. The ‘no excuses’ approach to forcing aboriginal children to attend school or have their parents lose their welfare payments is fascist in the extreme. This approach won’t work because children who was sick and ill and living in poverty will never attend school. Governments should be addressing the underlying causes of aboriginal poverty so aboriginal people are healthy and want to go to school. The funding of aboriginal children to go to boarding schools will create another stolen generation and is assimilation in practice. Aboriginal children going to boarding school from a young age will learn white culture and lose their aboriginal culture which can only be retained if practiced on their traditional lands. Abbott wants aboriginal adults to go to work. Allowing aboriginal people to return to their traditional lands to use as an economic based for their social, cultural and economic activities is the only way to have aboriginal people meaningfully engaged in employment. Any other strategy is assimilation. Abbott wants to ensure training leads to jobs. Australian governments have done this since the white man arrived here. Train aboriginal people for white man’s jobs but in areas where no such industry or jobs exits. Why do this? So governments can force aboriginal people off their land into cities to work for white employers. Aboriginal people must have their traditional lands back to create their own training and employment. This is just another assimilation approach. Abbott says they will invest in clinical health services for all aboriginal Australians, which is good, but he doesn’t commit any budget to it or say how he is going to do it. What this means is he is not going to do it. He has also committed to continuing the ‘closing the gap’ policy from Labor which has already proved it doesn’t work. Abbott would like to see all aboriginal people own their own homes. This means removing the traditional aboriginal value of communal living and ownership of land to the western value of individual ownership. Why? With individual ownership land can be a tradable commodity and aboriginal land can them be sold off and traditional aboriginal land rights will be gone forever. Yep, this is what it means. Abbott’s aboriginal policy is based upon the assumption that aboriginal people has surrendered their traditional lands and accept the sovereignty of the British and want to be subjects of their Queen. Aboriginal people always have and always will retain their sovereignty. The only way forward is for aboriginal nation groups to enter into treaties with Australian governments to stop them interfering in their lives and provide a legal basis so they can hold white Australians accountable for their misbehavior. There it is in a nutshell. Abbott’s aboriginal policy is racist in word, assimilation in practice and genocide in effect.